Iron Maiden are considering opening their own interactive museum filled with stage props and equipment from their lengthy career. “Eddie’s not that sensitive,” he laughed, referring to their legendary mascot. 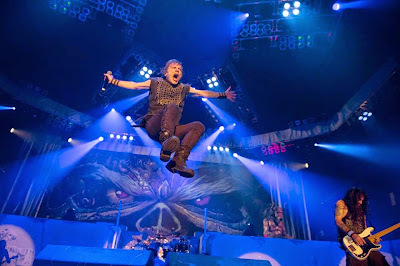 Iron Maiden played the final show of their Maiden England world tour with a headlining set at Sonisphere UK on Saturday, and fan-filmed video from the event is available here. The band played 100 shows to more than 2 million fans in 32 countries over the course of the 2-year tour, which began in June 2012 in Charlotte, North Carolina. Prior to the Sonisphere concert, Dickinson and The Great War Display Team staged a 12-minute air display in the skies above Knebworth Park. The staged “dogfight” commemorated the 100th Anniversary of The Great War; a 21st Century tribute to the exploits of both the English and German pilots who ruled Europe’s skies between 1914-1918. The show featured nine aircraft of 5 different types, all exact replicas of the planes used in WW1 combat. Dickinson was flying his very own Fokker Dr1 Triplane, the same model used by infamous German flying ace Manfred von Richthofen aka The Red Baron. Check out video of the aerial display here.